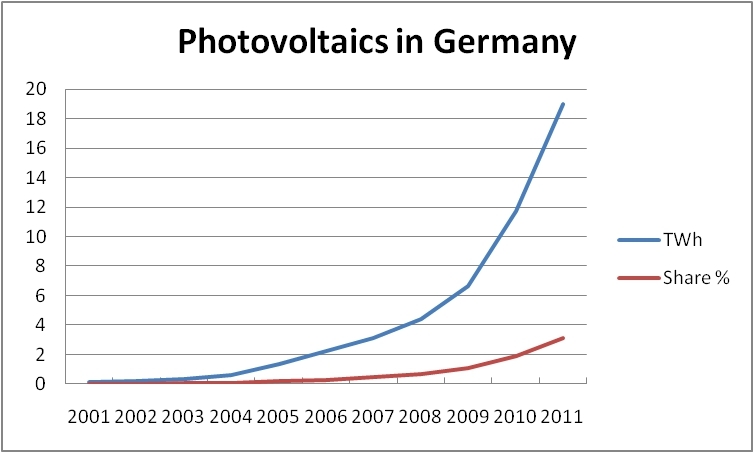 2011 was a very successful year for the German photovoltaics industry. More than 7500 MW of new capacity joined the electricity grid all over the country. This was the highest amount of newly installed solar capactiy ever. Germany is going green, faster than ever before. 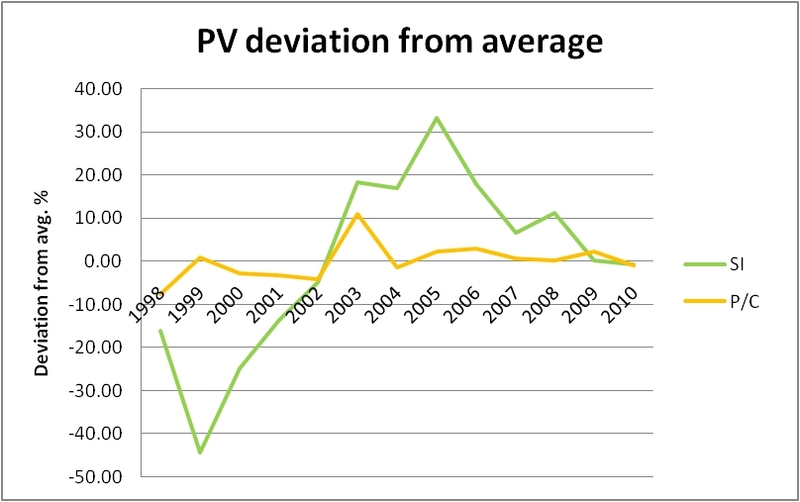 The increasing trend to use solar PV, however, comes at a price. Every kWh of solar electricity which is fed into the grid is currently subsidised with 3.59 cEUR. For every newly installed PV facility subsidies are guaranteed for 20 years. According to a paper by the RWI (Rheinisch-Westfälisches Institut für Wirtschaftsforschung), a German economy think tank, subsidies for photovoltaics will amount to about 18 billion EUR during the next few years. In total, the entire financial support given to the solar industry so far adds up to 100 billion EUR since the year 2000. This corresponds to about 4 % of Germany´s GDP in 2010. 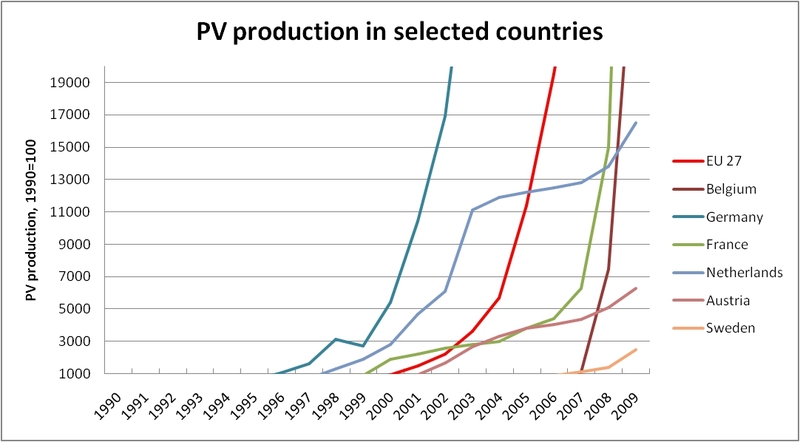 If the solar boom continues these figures are likely to rise. This means that electricity consumers will have to pay higher energy bills in order to support green technologies. Currently an average consumer (4500 kWh per year) would, thus, have to pay some 160 EUR on top of his/her electricity bill annually. In general, we tend to believe that Nordic countries are unsuitable when it comes to using solar panels. And indeed, at first glance this may seem like an odd idea: winters are long, dark and snowy making solar installations practically useless. Thus, whenever energy is needed most the solar pathway is blocked. However, the other side of the medal may becomes apparent during summer when the sun is shining much longer hours than in southern Europe. From this we conclude that the South generally receives more sunshine than the North. Furthermore, we see that a big part of the country gets on average more than 1600 hours of sunshine per year. As a reference we may compare this to one of the sunnier parts of Germany, the south-western federal state of Baden-Württemberg which has an average of about 1600 hours. However, it is not only the number of hours that counts, but more importantly, we have to look at the amount of irradiation coming from the sun onto a particular spot of the Earth´s surface. 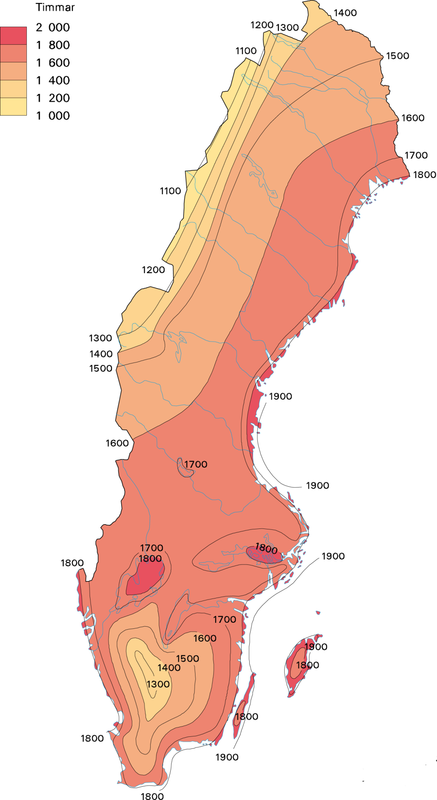 Here the data are as follows: a substantial part of Sweden (once again, predominantly in the southern areas up to about the latitude of Stockholm) gets more than 925 kWh/sqm of global irradiation. The respective values for Baden-Württemberg are some 1100 kWh/sqm. Thus the better part of Sweden receives only about 15% less irradiation than the south-west of Germany. We may therefore safely conclude that the situation for using solar energy in Sweden is far from hopeless. On the contrary, it appears that there is some potential for using it, all the more since solar panels have been improved significantly over the past years. Let us examine the issue by picking a particular location. The city of Linköping is located some 200 km south-west of Stockholm. 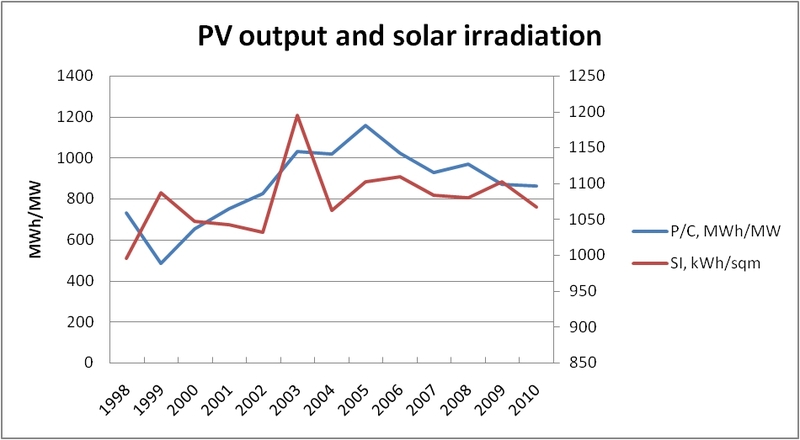 There, solar irradiation is about 950 kWh/sqm per year. Using solar modules with an efficiency of 10% , facing south at an angle of 45 degrees would safely provide us with an annual output of 95 kWh/sqm. Thus, a panel surface of at least 10 sqm should yield an output of roughly 1000 kWh, which is considered to be the threshold where solar panels become economically viable. Using a module of that size would correspond to estimated savings of about 1400 SEK (150 EUR) per year (at current electricity prizes). Taking this savings potential into account we conclude that the installation costs of the solar module of about 20000 SEK (2200 EUR) may well be amortized after a bit more than 14 years. Needless to say, that this amortization period would be shortend in case of increasing electricity prices and/or shrinking costs for installing the PV modules. Both these assumptions are quite realistic since energy costs, on the one hand, are very likely to rise (especially over the next years due to e.g. carbon taxes) whereas module costs, on the other hand, are expected to go down. In this context it may be worthwhile noting that module prices in Germany have slumped some 25% since January 2011.